Fairfax, CA - OCTOBER 11, 2016: Cal Men's Golf During the Alister MacKenzie Invitational at the Meadow Club. After two seasons at Cal of phenomenal play, junior Collin Morikawa had demonstrated what a special player he is; but this weekend, after a remarkable performance in the Walker Cup, Morikawa may have cemented his legacy on men’s golf as one of, if not the, greatest to ever play for the Bears. At the Los Angeles Country Club on Saturday and Sunday, junior Collin Morikawa took part in the historic Walker Cup. Morikawa didn’t just take part; he dominated. The junior from La Canada Flintridge led the United States team to a resounding 19-7 win and was one of three players in the entire field to win all four matches. In Saturday morning’s foursome match, Morikawa partnered with sophomore Norman Xiong from Oregon and made history. Morikawa and Xiong won the match by capturing eight of eleven holes with seven remaining (8 & 7), the greatest margin of victory in Walker Cup history. Then, Saturday afternoon, Morikawa continued his strong consistent play by defeating Paul McBride three and two. At the end of day one, the United States team led 8-4 in a race for 13.5 points, the minimum total the United States needs to reclaim the cup. On Sunday, it was more of the same for both Morikawa and the United States team. Partnering again with Xiong in the foursome match, the Cal junior again put in a stellar performance, defeating Connor Syme and Paul McBride by two. In the afternoon singles match, Morikawa took care of Harry Ellis two and one. 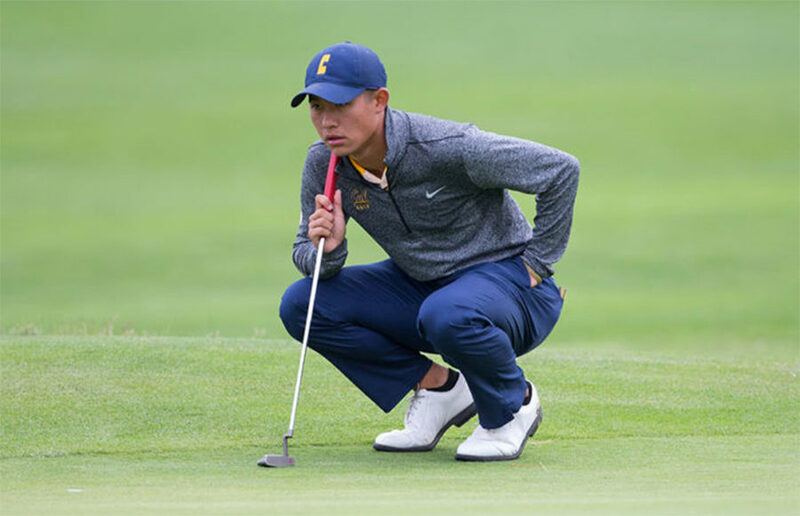 “Having Collin play well and representing Team USA and Cal is amazing for him and us,” said Cal head coach Walter Chun. On the other side of the country, in Rocky Face, Georgia, the rest of the Cal team was taking part in the Carpet Capital Collegiate Tournament. With this being the first tournament of the season, Cal looked to get off to a positive start. Overall, the Bears turned in a good but not great performance, coming in ninth place of 15 schools. While this was in the middle of the pack, it’s important to keep in mind that Cal was the only school that had to travel across the country and was playing without its best player in Morikawa. Although the Bears certainly would have liked to play better, there were some bright spots that Coach Chun can reflect on. Freshman Kaiwen Liu, in his first-ever collegiate tournament, turned in a top-10 finish on the individual leaderboard. He shot 73 (+1), 68 (-4) and 70 (-2) to finish the tournament at 211 (-5). Additionally, the team got positive results from redshirt sophomore Jamie Cheatham and redshirt junior KK Limbhasut, both of whom sat out last year to focus on school and improve their golf games. They respectively finished 220 (+4) and 215 (-1). Looking ahead, it is clear that the Bears have a solid core of players that should allow the team to compete in the rest of its tournaments. It was a mixed weekend for Cal golf fans. The team showcased its potential without its star, and with Morikawa in the mix going forward, the team has the makings to surprise some teams along the way. All in all, the Bears will be an exciting team to watch this season. Praveen Kuruppu covers men’s golf. Contact him at [email protected].